Old Machines, new fingers, and a revelation. My typing pool, hard at work. Started out simple enough. 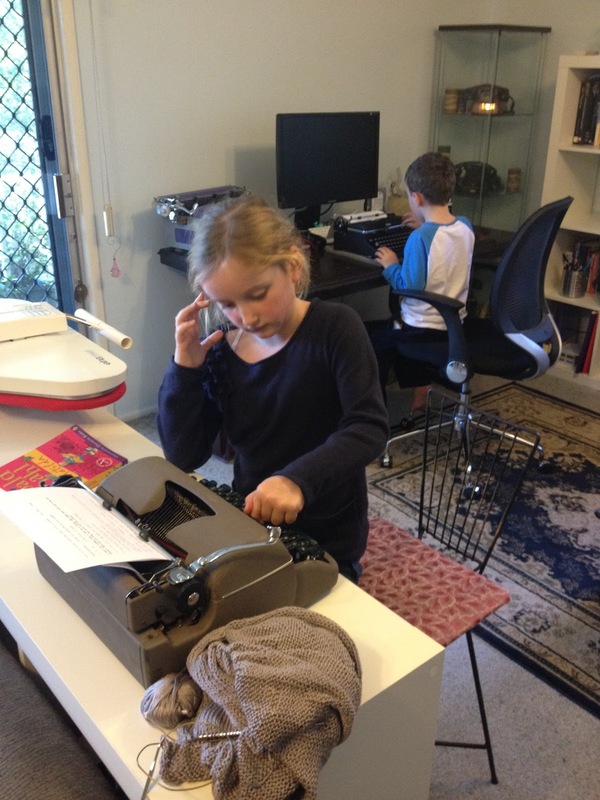 I had some family and their kids over for a visit, and I thought I’d whip out a typewriter and give them a bit of an ‘in the olden times’ show. I thought they’d get tired of it pretty quickly, being only 6 and 7 in age and pretty addicted to my iPad. But I was wrong. After I brought the Remington out, the other child decided that they wanted to have a play on one as well. So I brought out the Royal Arrow as also, and before long I couldn’t get them of the machines. They kept writing questions, for me to come and answer (on the typewriter), poems, and stories about farting. It wasn’t until they went to get some lunch about 2 hours later that they finally gave these old machines a rest. This was more than just play. Rory, the young boy – who had just turned 6, started picking up new words ultra quickly. He also learned how to spell other words that he had previously had trouble with, faster than he had before. When he learned that you couldn’t back-space back over words, his accuracy on the keyboard shot improved dramatically as he started to think about what he was writing. At this age, I was itching to get away from the typewriter and onto that amazing new technology called ‘the computer’. I kinda expected these guys to tire of it quickly. But they’re quite a competitive pair, and they saw these machines as a challenge to master. And I have to say, to me it was a revelation to see how quickly they were learning on these machines. I photographed the christening of the newest member of their family today, and it was a fair bit of fun. They’re a great family, and these are awesome kids. So I hope the rest of you had a great weekend. Have a good one chaps and chappettes. May 27, 2012 in cool., entertained., Kids, learning, Remington quiet-riter, royal arrow, spelling, typewriter. So… do you type-in here often? ← The Royal Arrow lives! It is indeed amazing (and wonderful) how long kids' attention spans can be when they use typewriters. Our nearest neighbors brought their 9-yr-old boy with them for a visit last year, and the son was fascinated with one of my typewriters. I put in a piece of paper and had him type his name. He spent the next HOUR doing that, happy as could be. Cameron, I know where you're coming from. I guess people are just drawn to a particularly machine. I handed the youngest one the Remington first, only because it is built like a tank, and I doubt they could to any damage to it. But then he jumped on the Royal and just stayed there having a ball. I sold a Remington Quiet Riter back home near Washington DC a few months ago and the exchange happened at a Chipotle (fast-food burrito restaurant). I felt strange bringing the typewriter out in the middle of a restaurant but I got only looks of approval. The two children (maybe 6-8 yrs old, both boys) at the table next to me couldn't stop staring at it. There is something magical and wonderful about a typewriter and it isn't lost even on those born in this millenium. You have some amazing looking typewriters though. It would have been fascinating to a boy, all this old machinery. They are…. amazing machines. There's nothing to see working in a computer – physically. But there's so much for kids to explore in a typewriter. Especially now as they are often just hidden machines in corners of people's homes – forgotten and unused. When they break out, the kids are usually seeing something new and unexpected. It's amazing!